Red, White and Blue, sound a little patriotic? Well, there's that too but today the All Things Creative Group have come together to curate a collection of over 200 red, white and blue DIY ideas that won't break the bank. That's a lot of DIY ideas! Now that it's Spring, there are loads of ideas for outdoor projects in this collection but if you're like us and still have snow on the ground, you'll find many indoor projects too. To keep the collection organized and easier on the eyes, we've grouped them into four separate categories. You decide which category, or all four, that pique your interest. Perhaps there are a few things in the collection that have been on the honey-do list and gives you the motivation and know-how to finally tackle that project. Regardless which ones you choose, we hope you walk away feeling inspired and motivated to build or transform something. One of the categories in this collection is Patriotic red white & blue and being a Canadian girl I didn't have anything to contribute. But it made me realize, nor did I have anything patriotic in red & white to share either. How sad that not one Canadian maple leaf project resides on this blog - that changes soon! As mentioned above, all projects shared in the collection were created by members of the All Things Creative group, blogging friends who come together each month to share only their best DIY ideas based on a specific category. 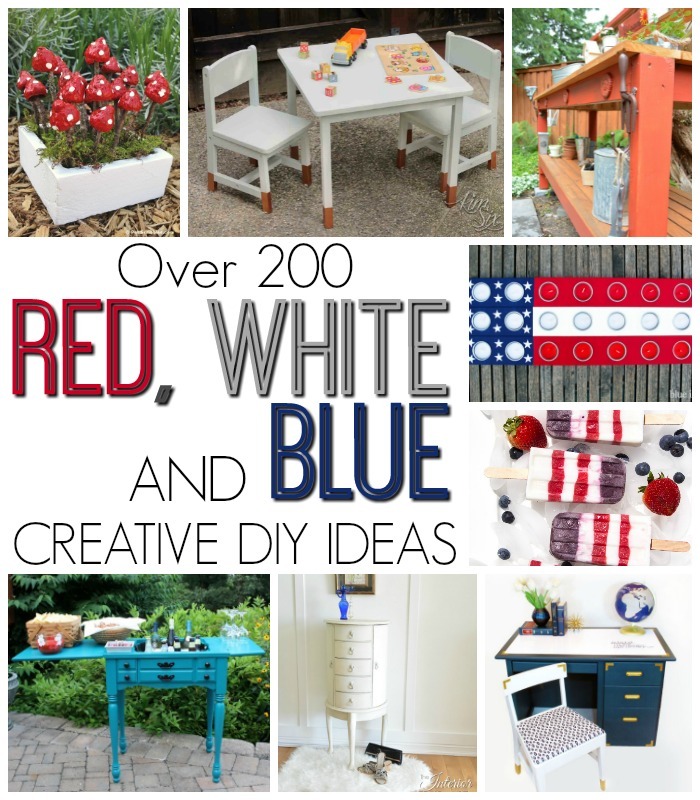 The graphic below shows just a sampling of the red, white and blue curated DIY ideas in the collection. It will help make it easier for you to find the links all in one place should you share our collection with friends and/or save it on Pinterest. Here are the links to ALL of the projects in each Red, White, Blue, and Patriotic category. Press the links on the DIY projects that pique your interest and it will take you directly to the project tutorials. We hope you walk away inspired, encouraged, and motivated - enjoy!